The tap, tap, tap on the door. You open slowly to discover a ghoulish group of goblins, ghosts and assorted friends standing on your porch. Then your eyes light on a flash of colour, a sparkle and twinkle. 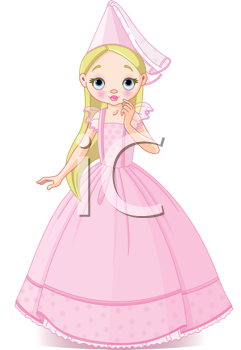 There, dressed in a profusion of pink, blonde ringlets and a glittering tiara is the princess. While the bevy of creepy friends accompanying her on this Halloween trick-or-treat mission are cute, the royal visitor is enchanting, bringing with her the magic of fairytales and childhood stories. I know there are exceptions, but I personally don't know of many little girls who haven't dreamed of being a princess. Some might argue that it perpetuates a stereotype, the weak and beautiful damsel whose only hope of rescue is from the handsome prince. But I think we can take it another way. Yes, the prince did save Cinderella from a life of drudgery, but it was her tenacity and daring that ultimately led her to him. Certainly Snow White needed the prince to awaken her, but in fleeing the evil Queen and creating a new life, she proved herself to be brave and fearless, a hard-worker and resourceful. Some might also say that it enforces the happily-ever-after myth and the expectations that come with it. But if we're honest is it wrong to want to feel like a princess, to be romanced and live a fairytale life? The trick is in finding the prince that will make it happen. In other words it's absolutely not about being a weak woman. It's quite the opposite. It's about not settling for less than you deserve.